It was not easy to start on our George Foreman indoor grill reviews. There are so many models that we had to look very hard to find the most popular ones. We have narrowed it down to what we think are the 5 best George Foreman electric indoor grills that gives you the most bang for your bucks and the ones with the highest customer ratings. All grills will have an in-depth review on their own page. This is with no doubt the most popular George Foreman grill and the best seller in many stores. ==>> Click here to read the full George Foreman GRP1060B review and see what we think about this number one selling contact grill. 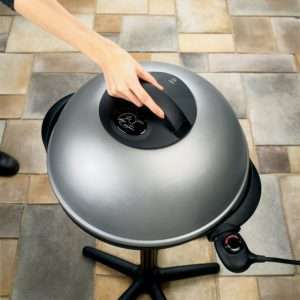 This is the smaller size indoor electric grill and great for single or two person households. 1000 watts is pretty powerful for a grill this size. ==>> Click here to read the full George Foreman GRP4 review and see what we think about this number one selling contact grill. This grill has 2 fixed plates and a 144 square inches cooking space. 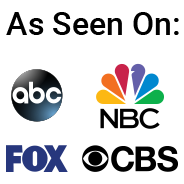 It received some great customer ratings from a lot of people. That is why we put in our top 5 George Foreman grill review. 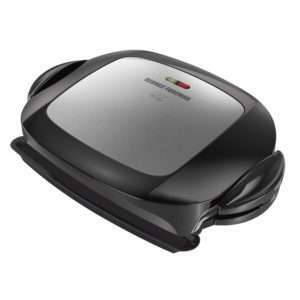 ==>> Click here to read the full George Foreman GR144 review and see what we think about this number one selling contact grill. Yes I know this is also an outdoor grill, but it is also a popular indoor grill if you take it of the standard and use it on your counter-top. Since it got such high ratings we decided to review it anyway. 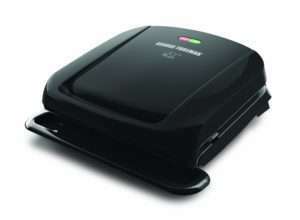 New model is the George Foreman GFO240S. 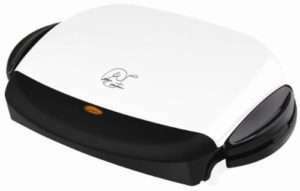 ==>> Click here to read the full George Foreman GGR50B review and see what many people think about this indoor/outdoor grill. 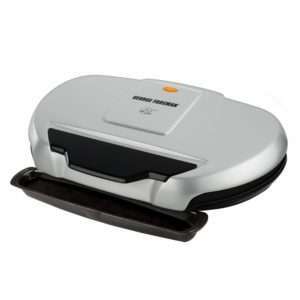 With 5 servings, removable plates and also can be used as Panini press this George Foreman is very versatile in use. The removable plates make it easy to clean. The color is platinum black. There are several questions people have about the George foreman grills we found after doing the George Foreman indoor grill reviews and we try them answer them here. Some history about these electric grills. They were actually invented by Michael Boehm, but George Foreman was the person used for marketing them. He claimed that his boxing successes were supported by healthy eating and introduced us to this brand electric indoor grill and had great success with them. All the George Foreman basically work in the same way. Here are the steps to take to operate a George Foreman grill. On average you should let it heat up for at least 5 minutes before starting to cook on it. Reason is that it gives it time to distribute the heat more evenly over the plates. How do you clean a George Foreman? Cleaning any electric grill right after using it is a very important step and is best done in a certain way. After cooling take the sponge we recommended. The removable plates of some of the George Foreman models can be cleaned in the dishwasher. If this George Foreman Indoor grill reviews did not help you find the indoor grill that fits your needs, we have more electric indoor grill reviews here for you.